Selecting a vehicle from the drop down list below will identify the specific power outlets kits that fit the vehicle. Powerlet offers all four outlet types for almost all motorcycles with this on-line vehicle selector. To find an outlet for non-motorcycle applications please call us at 586-932-6886. Below is a short selection of socket kits that have been identified to fit on a wide variety of Sport motorcycles. Not all of these kits may fit on your motorcycle, please select the proper kit(s) for your specific motorcycle from this standard list. This vehicle does not have a factory installed power outlet or power connector. Excess Electrical Capacity (EEC) is the amount of excess electrical power your vehicle has in reserve to power additional devices (appliances) without draining the vehicle battery. This number varies widely depending on the manufacturer, model and sometime model year of the vehicle. How to calculate EEC can be found here. Also see the FAQ for additional information. Email the engineers at Powerlet University for your vehicles maximum alternator output (MAO) and actual EEC. 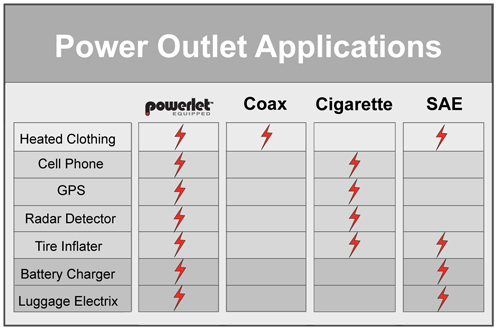 Decide what outlet type is best for your application(s). While more than one outlet can power multiple devices at the same time, it is also common to put more than one outlet on a vehicle. Sometimes this is required for high current loads like passenger heated clothing, or for devices in the front and rear of the vehicle like a GPS (right front) and a heated jacket liner (rear left). The four most common outlets are shown. Consider size, vibration, reliability, ease-of-use, location and how many electrical devices you may wish to power in the future. Consider what types of appliances you will power now and in the future. The chart below can help clarify which power outlet types are commonly used for each appliance listed. Purchases do not require creating a MyPowerlet Page (or account). For convenience, an account is not needed to checkout with any of our checkout methods, including Paypal, Google, or credit card. We like to keep it simple. Using the MyPowerlet Page, returning customers can check order history, track shipments and speed-up the checkout process by pre-populating the order address fields. We like putting technology to work. Poweret never sells e-mail addresses. We like our privacy too. © Copyright 2002-2019 Powerlet LLC. All Rights Reserved. Some products have patents or patents pending.